The easiest way for tourists coming from other parts of the world to get to Medjugorje is to fly to Split in Croatia . From the Split bus terminal, tourists can take a bus to Medjugorje. There are 3 daily buses to the town from the terminal. The journey takes about 3.5 hours and tickets can be bought from the terminal or can be paid for on board. An additional fee is charged for luggage. Tourists can also fly to Dubrovnik in Croatia and take a bus from there to reach Medjugorje. As Medjugorje is one of the biggest prayer centers and pilgrimage sites in the world, it is capable of accommodating thousands of people. There are a number of hotels that offer tourists affordable and comfortable accommodation. Tourists can choose from mid-range hotels to the more luxurious ones for accommodation that suits their preference. Some of the popular hotels in the town include Ruza Hotel, Globtour Inn, Hotel Brotnjo and Hotel AnaMaria. Tourists should make arrangements for accommodations well in advance if they are visiting during the Youth Festival as Medjugorje can get quite crowded around this time of the year. The Marian shrine is one of the most popular attractions in Medjugorje. In addition to this, there are a few other places that tourists must visit in the town. This includes the White Cross Hill, also known as the Cross Mountain which is quite close to the town. The path up to the white cross erected at the peak is lined with the different stations of the cross. 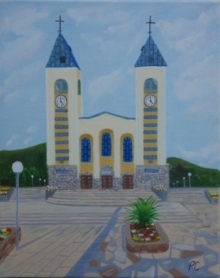 St. James Church and the Cenacolo are two other spots that tourists can visit when they are in Medjugorje.